records – Now Beer This! It has taken quite a long time for the Decemberists to grow on me. Although they have been around for about 15 years, it is only now that I am beginning to realize their brilliance. At least, enough to write a review of their latest record, What A Terrible World, What A Beautiful World. Cleveland, the Rock and Roll Capital of the World. Also home to some great breweries and places to eat and enjoy these brews. I visited this fine city a few weeks ago to visit a dear friend of mine. Here are some of the things I ate, record stores I went to, and beers I drank. On route to Cleveland, I had a layover in Philadelphia, which gave me plenty of time to sit down with a Chocolate Love Stout from the Pennsylvania brewery Yards. I had this in lieu of another cup of coffee when I arrived at the airport at 8:30 AM. Dark, malty, a great winter brew. Jet Rock, the bar at the airport that I had this at was actually really awesome and had a ton of craft beer on tap. Totally a great recommendation if you have a layover there. When I got to Cleveland, the first food stop was the Happy Dog. Basically for $5 you can get either a meat or vegan dog with anything you want on it. Seriously. Anything. I went for the pimento mac and cheese, ginger sesame coleslaw, black truffle honey mustard, bacon balsamic marmalade, and topped with a fried egg. YUM. I tried the peanut butter cup coffee porter from Ohio brewery Willoughby Brewing, which was good but didn’t really sit well with all those hot dog toppings. I have yet to find a truly great peanut butter beer too, although this one comes pretty close. 3Floyds has limited distribution in Ohio, so I jumped at the chance to find one of their beers on draft at the Happy Dog. They had Gumballhead, the American wheat ale apparently named for an underground comic book cat. It’s definitely the kind of wheat beer I would expect from 3Floyds- full of flavor, with flavors of late summer fruit like peach, orange marmalade, and other citrus notes. I closed up with a pint of Fat Heads Bumble Berry Honey Blueberry ale. One of the best blueberry ales I’ve ever had by far. Refreshing, but not overly sweet from the honey. It’s a great beer to finish off the last few warm days before autumn begins. In the evening, I toured Great Lakes Brewing Company. They are celebrating their 25th anniversary as a brewery this year, and have grown exponentially in this time, currently producing 125,000 barrels a year and distribute to 13 states. Their beers are award-winning. The Great American Beer Festival Gold Medalist, Dortmunder Gold, is a favorite at bars all over Cleveland. I tasted the Oktoberfest amber lager, Edmund Fitzgerald porter, and Eliot Ness amber lager. The porter was definitely my favorite, followed by the Eliot Ness and Dortmunder Gold respectively. Both the Dortmunder and the Eliot Ness use Mount Hood hops, but Eliot Ness has a greater variety of malts, including Munich, one of my favorites. I later went for a pint of the seasonal imperial red ale, Nosferatu. Definitely a nice change from the Oktoberfests and Pumpkin ales of the autumn. Big and hoppy, with an awesome ruby red color. Inside the brewery, they were working on the popular Christmas Ale, which is brewed with honey, ginger, and cinnamon. Needless to say, it smelled amazing inside there. The Christmas Ale is apparently a popular and sought-after beer in the Cleveland area. As soon as it’s released, people rush after it to enjoy it. Great Lakes also recently attempted a Sumerian-style beer. I am fascinated by ancient ales and was interested to see how the Cleveland brewery went about this one. First they collaborated with a team of professors from the Oriental Institute at the University of Chicago. They brewed the beer as close as possible to the way it was made 4,000 years ago, foregoing stainless steel fermenters for ceramic vessels recovered from Iraq, heated over a manure-fueled fire. The beer itself was spiced with cardamom and coriander, and sweetened with dates. The Sumerian beer was unfortunately not available for tasting and won’t be seen around the brewpub anytime soon, however. 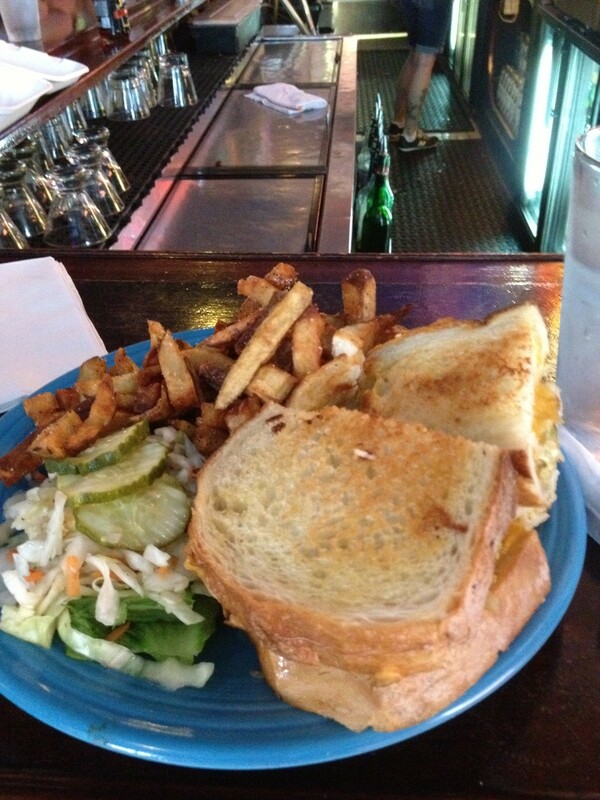 My next day in Cleveland involved a trip to Melt, a self-described “bar and grilled”, with grilled cheese sandwiches that can only be described as EPIC. I went for the Parmageddon- which is potato and onion pierogies with napa vodka sauerkraut and sauteed onions sandwiched between two huge slices of bread with cheddar cheese. My drink of choice was a “beerita”, a margarita made with Dogfish Head 60 Minute IPA. Really interesting drink! The hoppiness of the IPA balanced out the sweetness of the margarita really well and I didn’t even mind the salt rimmed pint glass. Oh yeah. As if this place doesn’t need to be any better, it’s also got a ton of KISS-themed stuff everywhere. Now That’s Class is a great punk rock bar, with skate ramps in the back room and plenty of cold Schlitz tallboys. After all the cheese and deliciousness I had consumed however, I kept my beer drinking light with a Southern Tier Hop Sun wheat ale. I ventured over for a monthly “noise lunch”, where musicians sign up and create noise music based around a given theme. This month’s theme required musicians to interpret art pieces through their music. It was really great, and unlike anything I had seen before. That’s just one example of the wonderful music and arts scene around Cleveland. In some ways, it reminds me a lot of Brooklyn but less snobby and expensive to live in. Very welcoming for new musicians too. Speaking of music, there are so many great record stores in the area. My Mind’s Eye was my favorite, where the only Black Sabbath albums in the store were from the Bill Ward-era. Blue Arrow was great too, especially because it doubles as a cat rescue organization in the back. Loop is another shop that does double duty, which is a coffee shop downstairs and a record shop upstairs. I picked up Skeletonwitch’s Forever Abomination on clear and green speckled vinyl (for $7!! ), Sabbath Bloody Sabbath, and the Doors Strange Days. Speaking of music, at any point that I was in a car during my trip, we generally rocked out to the sweet sounds of one of my favorite college radio stations- WRUW from Case Western Reserve University. I unfortunately missed their annual Studio-A-Rama concert (this year featured Mikal Cronin as the headliner), but I will always support this awesome station and listen online whenever I can at home! A lot of cool local-Cleveland bands and talk shows, and a ton of variety on the airwaves. It’s worth checking out whether you live out there or not! Other notable places: The Beachland Ballroom (where I had a beer-y Mary with tomato juice, vodka, and Newcastle! ), Barrio (which is kind of like a taco version of the Happy Dog where you can pretty much get anything you want on your taco), the Five O’Clock Lounge (where I won a dance contest at the Secret Soul Club), and Nano Brew (which has a bicycle repair station at the back of the bar!). And of course, the Rock and Roll Hall of Fame Museum! Seeing all the Rush stuff was a RUSH to say the least… But seriously, it’s probably one of the coolest museums ever. Thanks to Adam Spektor, host of the Spektrum on WRUW and all the new friends I met while visiting! Can’t wait to come back!